We live in crazy times and there is not nearly enough time in a one hour podcast to touch upon it all. So let’s focus on what matters first. White supremacists run the White House and they are trying to tell you that protest against their unconstitutional and illegal actions is bad. DO. NOT. LISTEN. PROTEST. IS. AS. AMERICAN. AS. IT. GETS. Mary Ann Vecchio screams as she kneels over the body of fellow student Jeffrey Miller during an anti-war demonstration at Kent State University, Ohio, May 4, 1970. Four students were killed when Ohio National Guard troops fired at some 600 anti-war demonstrators. A cropped version of this image won the Pulitzer Prize. 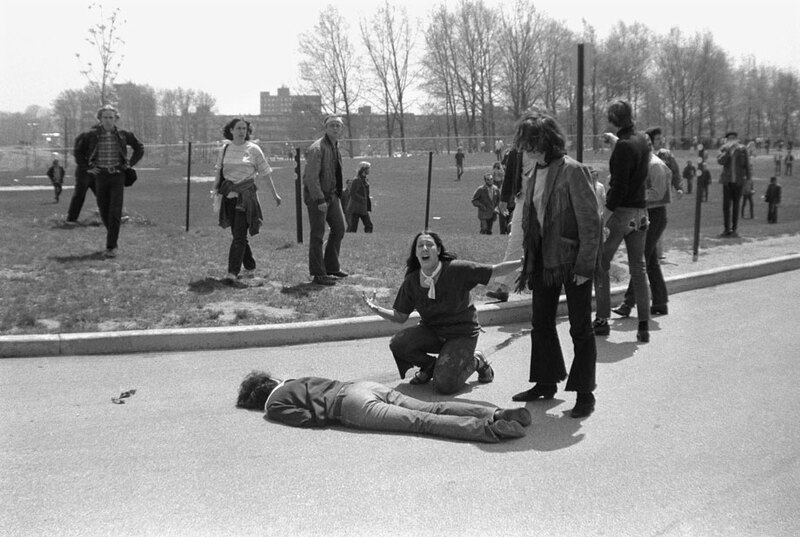 On May 4, 1970 four young Kent State students were killed when the Ohio National Guard fired at unarmed protesters during an anti-war protest against our involvement in Vietnam. This event is referred to in our history books as the Kent State Massacre. The Kent State protest, one of the largest in our country, is widely credited with putting an end to the Vietnam War and ultimately helped seal the end Richard Nixon’s presidency. Watergate did quite a bit to help too of course. 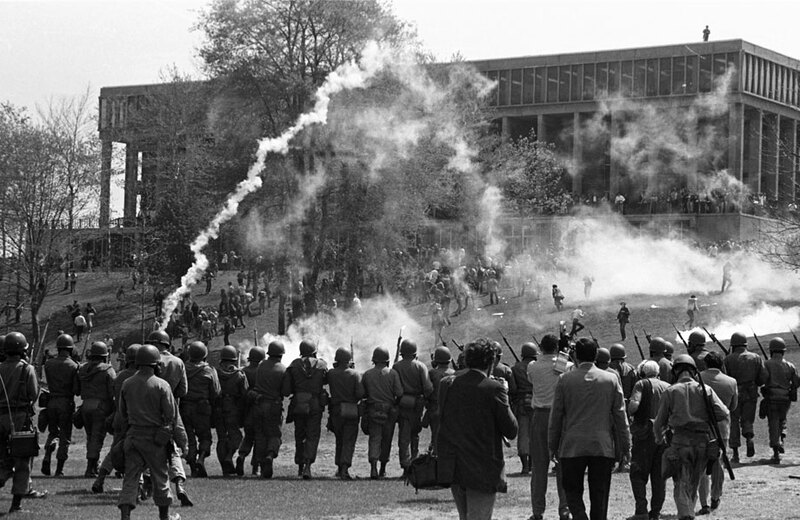 The National Guard fire tear gas to disperse the crowd of students gathered on the commons, May 4, 1970. Protest isn’t inherently violent and far too often they end up that way because of those who object to the message of the protest. Police brutality versus civil rights activists has been well documented and if you aren’t familiar you should read up on it. Suppression of the people by any means necessary goes hand in hand with authoritarianism. We must never cede our right as citizens and watch dogs of federal overreach to protest against injustice. In sporting news, more information is tricking out about the sexual assault allegations against Baylor students and athletes and how the university responded. There are several excellent articles out there on the latest and I particularly enjoyed this from Jenny Dial Creech of the Houston Chronicle, as well as this one by Sharon Grigsby with the Dallas News. Here are some pertinent excerpts from the latter, including a statement from one of the victims that you should definitely read. Elsewhere, we are three days into Black History Month and the Bannon Administration has done two notable things: remove the word black from the name calling it “African American History Month” and by celebrating a white man, Abraham Lincoln, while trying to call it national freedom. In the process, they managed to establish complete and utter ignorance of Frederick Douglass, one of the greatest of the great civil rights activists. What a time to be alive. Fortunately, the man I pretend is my president while I cry myself to sleep at night, San Antonio Spurs head coach Greg Popovich, is here to set the record straight, calling slavery and racism our “national sin.” His thoughtful comments are a welcome breath of fresh air and you can count me in on the #PopovichDuncan2020 ticket. You can read the full transcript via Mike Wright at ESPN here. In our sports segment I was joined by Traci McCartney (@tracimc) of NFL Female to preview Sunday’s big game between the Atlanta Falcons (the official Super Bowl team of The Resistance) and the New England Trumpiots. A wide range of topics were explored including the tuck rule and #deflategate. Two excellent offenses will be on the field but it seems likely the game could be decided by which defense makes more plays. Cheers to a good game and of course Go Falcons! You can listen to today’s podcast here.